Millie, aka CL Full of Laughs, is a darling 3½-year-old brindle female born September 6, 2003. Her sire is Kiowa Sweet Trey and her dam is Rio Clover, making her grand sire P’s Raising Cain. 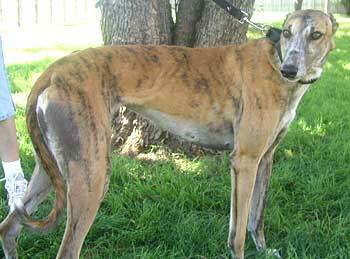 Millie’s racing career started May 26, 2005 at Gulf Greyhound Park in La Marque, and finished 85 races later on January 27, 2007 at Valley Race Park in Harlingen. 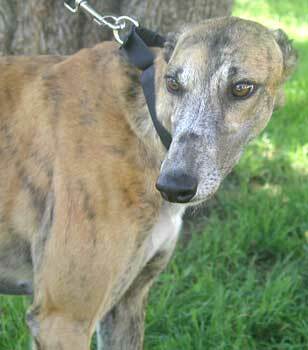 Millie was one of the 43 greyhounds received on Easter Sunday when Valley Race Park closed for the season. Millie is one sweet, lovable girl who is ready for her forever home. It is not known at this time if Millie is cat or small animal tolerant. Millie is a very sweet and fun-loving gal. She has lots of energy that would be great when paired with kids, or an energetic family. She loves to play with other dogs, but we don't know about cats. However, when cats are in the yard or on the street she generally doesn't pay a lot of attention to them. Millie's racing name, Full of Laughs, certainly fits her demeanor and outlook on life. When she is at rest and makes eye contact with you, she can't help but start wagging her tail with excitement. Millie has a tendancy to get toys or shoes out when she gets nervous (when no one is around), however, if she has chew toys or rawhides around her, she prefers those. She does not chew to destroy; mainly it just gives her something to do. Millie's main focus in life is about building a relationship with her permanent family. She will follow you from room to room, inside or out, just to stay near you. She is house trained and kennel trained and is looking for her forever home. This energetic girl would be a GREYT family addition.